If you have a beloved family dog, like millions of other Americans do, chances are slim that you believe it would ever bite anyone. After all, who knows your dog better than you? Despite what you may think, any dog is capable of causing a dog bite injury. Even the most well behaved dogs can lash out unexpectedly. If you find yourself in a situation where your dog has injured someone through a dog bite, these steps may be helpful in navigating through what can be a confusing and scary situation. Keeping calm is going to be difficult if your dog has just bitten someone, but you’ve got to do your best. It will be a lot easier to get your dog under control and provide medical assistance if necessary, if you remain calm. At this point your focus should be on making sure that your animal is prevented from causing any more injuries and that those in need of medical assistance are able to be helped. If a serious dog bite injury has resulted, call 911 right away. Let the 911 operator know where the injured person is located and what kind of injuries that they sustained. Give your name, phone number and address to the victim and get theirs in return. If there were any witnesses to the bite, ask for their information as well. Additionally it may be helpful for the injured person to know whether or not your dog is current on its vaccinations. In many jurisdictions, a reported dog bite requires follow-up by animal control officers or the police. If an officer comes knocking on your door, they may want to see your dog’s veterinary records and hear your side of the incident. Often dog bite victims will have medical bills and expenses related to the incident. In serious cases, the bills and medical treatment can be very substantial. You may be contacted by the dog bite victim or their lawyer. In some cases you may be asked to provide your insurance information and in some cases you may be served with a lawsuit. You should consider speaking to a lawyer that handles civil defense litigation cases or potentially your homeowners insurance company if you have one. Many people that have a homeowner’s policy that may provide coverage for a dog bite injury do not want to file claims with their insurance carrier because they know that claims can increase their premiums or even lead to a loss of coverage. In many cases people will decide to let their insurance company get involved once they have been served with a lawsuit or the threat of one. Our office does not handle dog bite defense cases because we only represent plaintiffs. However if you are the victim of a dog bite in Charlotte, you have rights and there are also steps that you should take to protect yourself. Call our team of experienced dog bite attorneys to discover more about recovering compensation for your injuries. Your consultation is free and hiring our law firm does not require any initial payments to be made to us. We work on a contingency basis, which means we only get paid if we are able to help you obtain a settlement or verdict. Involvement in a traffic collision can be a hassle to say the least. If you are lucky, the accident is a minor one, you exchange information with the other driver and go about your day. If luck isn’t on your side, there is severe damage or even worse, injuries. Imagine being involved in a serious vehicle accident only to find out that the other driver doesn’t have insurance. What are you supposed to do now? The good news is that you have rights if the driver you are involved in a collision with has no insurance or is underinsured. It is a state requirement that people have adequate insurance coverage in order to lawfully operate a motor vehicle. That said, there are people sharing the road with you that are breaking this law. If you are involved in a collision and discover that the other driver has no insurance, you may have some options. If you have purchased uninsured/underinsured coverage as part of your own policy, you can file a claim with your own insurance. If the at-fault driver doesn’t have enough insurance to cover all of the damages and injuries, your own insurance may make up the difference. That is called an underinsured claim. It is common for people to feel that they shouldn’t have to use their own insurance since they were not at fault. There are two things to consider regarding this issue. 1. You have uninsured coverage to protect yourself in this situation and 2. going through your own insurance company may be your only viable option for collecting compensation for your damaged vehicle and injuries. If your insurance company should pay you for an uninsured motorist claim they may try to collect their money back from the uninsured driver through a process called subrogation. If there isn’t enough insurance money to cover all of the damages and you were unable to be compensated through your own insurance carrier, you may consider an attempt to secure a judgment by taking the uninsured driver to court. If you are successful in proving your case, a court may order the at-fault party to pay you a judgment. While it is certainly within your rights to file a civil action, know that it can be difficult to collect a judgment in some instances. When a driver does not have auto insurance, many times it is because they cannot afford it. This means that they may not be able to afford paying whatever a judge orders. If you have been injured in an accident that isn’t your fault and the other driver didn’t have insurance, call us. If hired, our office will be able to confirm whether or not the driver had valid insurance at the time of the accident and additionally we will be able to let you know all of the benefits you may have available to you through your own insurance carrier. When you have been injured in an automobile accident, you could be facing large medical bills, time off of work and more. Do not assume that you have to suffer financially due to someone’s poor choices. If you have been injured in a car accident in Charlotte, North Carolina or somewhere else in our beautiful state, our team of personal injury attorneys is here to assist you. We will put our 25+ years of experience and knowledge to work for you and fight to get you the compensation you deserve. Call our office today to schedule an appointment for a free case evaluation and talk to us about how we may be able to help you. If you drive on the highway on a regular basis, it’s fair to say that you have driven near an 18-wheeler. For many people, the thought of cruising along side a large truck is nerve wracking. Your heart speeds up, your blood pressure rises and you become anxious. This is completely normal. Considering that a semi truck is a very large and fast moving vehicle, it’s easy to see how people may become stressed when having to drive near a tractor trailer. In most instances, you can drive along side a big rig and pass it with no problem. In other instances you may find yourself forced into another lane or, worse, the shoulder. In situations like that, you may believe that the tractor trailer driver is driving aggressive or unsafely. 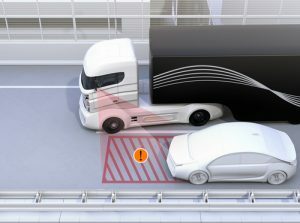 However, there is a better explanation and it is simple; the driver of the 18 wheeler may not have seen you because of a blind spot. When you slip behind the wheel of your vehicle, you are aware that you have two blind spots on either side of your car. For most non commercial vehicles dealing with a blind spot is as easy as adjusting the mirrors and looking over your shoulders before you change lanes or merge onto the highway. It’s not quite that simple for truckers. When you find yourself in any of these danger zone areas, the best move is to get out of the danger zone as quickly and safely as possible. This may mean you have to speed up slightly to pass or get ahead of the truck, or you may have to let off the gas and fall behind a few feet more. Imagine driving your own car and having your side windows and mirrors blacked out. Imagine that your rear window is blacked out as well. Now consider how difficult it would be to be sure you were changing lanes safely. This is what truckers face every time they drive. Help keep the roads safe by doing your best to be aware of these danger zones and try to avoid them when possible. It can be easy to get frustrated while driving. Traffic moves too slowly, especially during rush hour, and you have places to go. Don’t get so frustrated that you crowd a semi. You’re not only putting yourself in harm’s way — a truck accident can quite easily cause a chain reaction. If you can’t see the truck driver in one of the cab’s side mirrors, assume that the trucker can’t see you. If you have been injured in a truck accident in Charlotte or elsewhere in North Carolina, and the truck driver was at fault, you may have a case that could entitle you to compensation and other protections that the law allows for such as money for lost wages and pain and suffering. Reach out to our team of experienced accident attorneys today for a free case evaluation. We will discuss your accident with you and help you determine your best plan for moving forward after your accident. Please drive safe and let us know if we can help you. When a person is involved in a single-vehicle crash, they are often categorized as run-off-road (ROR) crashes. An ROR is said to have occurred when a vehicle travels off the road and onto the median, shoulder, a parking lane or other area not considered to be the roadway, and hits an object or pedestrian. Serious injuries may occur as the result of an ROR. Statistics show that these accidents have a higher fatality rate than those involving two or more vehicles. Here are ways that you can reduce your risk of being involved in an ROR. 1. Avoid curvy roads. This is especially true if it is a road you are unfamiliar with or you are driving at night. Likewise, drivers may want to avoid rural, isolated routes. 2. Avoid winter storms. It should come as no surprise that RORs occur frequently in the winter months. Snow-covered and icy roads prevent hazards that dry roads don’t. Experts suggest staying off the road during a snow storm and for the first day following the storm. 3. Avoid speeding. When you see a posted speed limit, it means that it is the safe speed of travel for that stretch of roadway. Don’t speed to get where you are going. 4. Don’t drink and drive. During a 16 year time period, 2001 through 2007, just over 85 percent of people who had a blood alcohol concentration of .01 or higher were involved in ROR crashes. This is compared to just over 58 percent of sober drivers involved in these crashes during the same period of time. 5. Avoid driving while drowsy. Drowsy driving can be just as dangerous as drunk driving. Don’t drive if you haven’t had enough sleep. It’s understandable that you will have to drive when you’re tired from time to time, but do what you can to keep yourself alert. Drink coffee, put the window down and play some upbeat music. 6. Avoid distracted driving. Distracted driving occurs when you are doing anything inside your vehicle that takes your concentration off of the road. Eating, drinking, applying makeup, fixing your hair and even talking to your passengers can all take away from your focus and increase your risk of having an accident. If you find yourself leaving the roadway, one of the worst things you can do is overcorrect. Instead, let off of the accelerator and slow down naturally. As you slow, gently steer yourself back onto the road if it is safe to do so. Be sure to look for other vehicles on the road before you pull off of the shoulder. When you are dealing with an injury caused by a car accident in Charlotte or elsewhere in North Carolina that wasn’t your fault, you probably have a lot of questions. Reach out to our experienced attorneys for help in answering those questions and help fighting for the compensation you deserve. Call our office today to schedule your free evaluation and let us advise you of your legal options. We are here to help! There are very few, if any people, who don’t understand what drunk driving is. People are beginning to learn more about the dangers of distracted driving. If you are like many, you’ve never considered that dehydrated driving could be dangerous, but research shows that it is. Now that North Carolina is firmly planted in the hot weather, dehydrated driving is a very real possibility. Whether you are stuck in a hot vehicle and no air conditioning or suited up in gear to ride a motorcycle, the hotter you get, the faster your body loses water. If you aren’t keeping yourself hydrated, you can experience serious issues that could impact the way you drive. When your body loses water through sweat, and even just breathing, you may feel thirsty. Some people choose to ignore this first sign of dehydration, especially when driving. You may not want to have to stop to go to the bathroom, slowing your progress. When ignored, the symptoms of dehydration can intensify. A person may experience fatigue, dry mouth, dizziness, bad breath and headaches. A typically-sized adult male needs about two liters of water per day to remain hydrated. More water is required in excessive temperatures. When you experience symptoms of dehydration such as dizziness, headache and fatigue, your ability to concentrate on the road is affected in a negative way. You may find that your reaction time is dulled, and you are putting yourself, your passengers and others on the road at risk. Always carry a bottle of water with you when you are driving. You never know what lies ahead, and having water can make all the difference. You can also eat foods that are rich in water before your journey. Cucumbers, strawberries and bananas are all good choices. If you begin to notice the signs of dehydration, get plenty of liquid in your body. Wait for about 15 minutes to see if you feel better. Driving while you are dehydrated is entirely avoidable. When you are involved in a car accident in Charlotte, you will likely be worried and stressed. If you suffer an injury, you may be entitled to compensation for your medical bills, lost wages and more. Call our experienced team of car accident attorneys for more information about your legal rights and to schedule a free case evaluation. We are here to assist you. According to recent statistics, there have been more than 700 children since 1998 that have passed away after being left in hot cars. This year so far, 12 children have died in hot cars. While it is clearly the children who suffer most, parents and guardians of these children are understandably devastated. These horrible accidents can be prevented — and should be. Representative Tim Ryan (D-Ohio) wants to make sure that these tragedies stop. Ryan introduced a bill into the legislature on June 7. The bill, titled HOT CARS Act of 2017, is co-sponsored by Peter T. King of New York and Jan Schakowsky of Illinois. The bill outlines a plan for the requirement of a warning system if children are left in the backseat after a car’s engine has been turned off. The cost of implementing the technology is small, and General Motors already has it in place in many of its models dated 2017 and later. Many people simply don’t think that a car is any hotter than the air temperature outside. Others believe that they will only be out of the car for “a minute,” and end up taking far longer. According to those who understand heat stroke deaths, here is a timeline for the temperatures of the interior of vehicles. 0 minutes: the air inside the car will be the same as the air outside of the car. 10 minutes: temperatures inside the car climb to approximately 19 degrees higher than those outside. 20 minutes: temperatures are 29 degrees higher inside of the car. 30 minutes: temperatures are 34 degrees higher inside of the car. 40 minutes: on a 70 degree day, the temperature inside of the car is 111 degrees. 60 minutes: on a 90 degree day, the temperature inside of a car that has been closed for an hour is approximately 140 degrees. Children are not left in hot cars because their parents don’t care. Rather, it is often attributed to forgetfulness or a sense of being on auto-pilot. In many cases, it occurs when a parent who does not normally transport the child on that day or time takes them. The parent is used to their routine and distracted by other thoughts, essentially forgetting that they have their child at all. According to experts, this is a brain science issue and not a neglect issue. Technology, such as that introduced in the bill, may help bridge the gap between routine and necessary behaviors. If a parent has a child in the backseat, they should put their purse, wallet, work bag and even cell phone in the backseat as well. The parent may remember that they carried their bag or wallet and also be reminded that their child has traveled with them. If your child has suffered an injury in North Carolina due to someone’s neglect, you may have the legal right to compensation. Call our attorneys today to schedule a free case evaluation and learn more about what you may be entitled to. Summer may not be in full swing quite yet, but we are getting close. With the rise of the temperatures and the availability of sunshine, we will soon begin to see an uptick in warm-weather accidents. Here are some of those dangers and how you and your family can avoid them. Studies have shown that more teenagers are killed in vehicle collisions between Memorial and Labor Days than any other time of year. It doesn’t mean that your teen has to hang up the keys for the summer, but you should take the time to review safety rules with them. Heat stroke is a possibility for anyone. Spending too much time in the hot summer sun can cause the human body to overheat. When the body overheats in an extreme way, heat stroke can occur. Signs include headache, confusion, nausea and vomiting. Any person spending time in the hot summer weather should be sure to stay hydrated and take frequent breaks in the shade. Boating and drowning accidents peak during the summer. Don’t let anyone near your pool without supervision, take your kids to swim lessons if you haven’t already, and make sure everyone on the boat has a life vest. Food poisoning isn’t often thought of as a summertime injury, but it is. With the abundance of picnics, it stands to reason that food poisoning spikes during hot weather. If you are having a cookout, make sure that there are plenty of coolers filled with ice to store food. If you are uncertain about the safe condition of any food, don’t chance it; throw it away. Fireworks used to be centered around the July 4th holiday, but people tend to set them off all summer long these days. No child should ever touch a firework, lit or not. Any adult using a firework should understand how to handle it carefully, and there should be a safety plan in place in case of accident. Don’t forget about your furry family members this summer season. Dogs and cats are at the same risks, for the most part, as humans. Bug bites, heat stroke and poisoning can all occur in your pets. Do not leave your animal unattended, and make sure your pet has lots of clean water available. While some summertime accidents cannot be avoided, many can. When you put safety procedures into place, you can reduce your risk of injury. Have fun this summer and enjoy your time with friends and family — just be safe while you are doing it. If you do happen to be injured in an accident due to negligence in Charlotte or elsewhere in the state of North Carolina this season, reach out to our team of experienced personal injury attorneys for a consultation. We are here for you and your family and would like to advise you of your legal rights. There are approximately 1,250 golf courses in America. Golf carts are being used off the course as well. They are used on college campuses, in sports stadiums and even on private properties. Over a 16-year span, from 1990 to 2006, the American Journal of Preventative Medicine says that there were close to 150,000 people injured in accidents involving golf carts. Most of these accidents were attributed to someone’s negligence. We understand that you may have some questions after you have been involved in a golf cart accident. We are here to help answer some of those questions. 1. Is there a statute of limitations? Yes. Depending on when and where the accident happened, there is most likely a limited amount of time for you to file a lawsuit. If you do not file your claim within a certain time frame, it may be barred from court. In North Carolina, that limit is generally three years. There are many different rules and exceptions that govern the time allowed for the filing of a lawsuit. Please speak with a lawyer to determine the statute of limitations that governs your claim. 2. Who should I name in my lawsuit? A golf cart is considered a vehicle. The person driving the cart at the time of your accident may be named in the lawsuit if they were negligent. The owner of the cart, if different than the driver, may also be named in certain circumstances. The owner and managers of the facility in which your accident occurred may be named in the lawsuit if the accident can be attributed to improper grounds maintenance or another issue. 3. How do I establish liability? You will need to show the court that the person you are claiming was negligent had a reasonable duty for care. You must show that they breached that duty, that you were injured, and that your injuries were a direct result of that negligence. 4. What damages are available? If you can prove your claim, you may be entitled to a range of damages. These include medical bills, property damage, lost wages and more. Your attorney can help you determine exactly what damages you may be entitled to based upon the unique circumstances of your accident. 5. What are my first steps? The first step in any personal injury proceeding is to find a reputable and experienced attorney. While you can certainly file a lawsuit on your own, an attorney will have the knowledge necessary to prove your case and secure the compensation you are entitled to. If you have been injured in a golf cart accident in Charlotte, you have legal rights you may not be aware of. Whether you have sustained property damage or injury, you may be entitled to compensation for your financial loss. Call our team of experienced attorneys today to speak us about your potential claims. Time is of the essence; schedule your free consultation now. Very few people will argue that being involved in a vehicle collision is stressful. A car accident is a frightening experience and many people experience anxiety and other emotions in its aftermath. When an accident victim experiences emotional distress or mental anguish after the incident, they may be entitled to recover damages. Post traumatic stress disorder is something that most people associate with combat. In truth, PTSD can be experienced after any traumatic event. That said, it can be difficult to prove because it is invisible. Unlike the broken bones, contusions and other physical injuries sustained in a vehicle collision, PTSD is unseen. Recovering damages for PTSD is typically more complicated than recovering damages for physical injuries. In order to obtain damages for PTSD following a car crash, the victim must be able to show that a qualified doctor accurately diagnosed the condition. The victim must also prove that the diagnosis is directly related to the incident. For this to happen, an experienced expert witness may be called to testify. Even when PTSD is attributed to the incident, a prior trauma may be brought up by the insurance company or their lawyers. The defense will likely argue that the PTSD arose from another trauma and not the accident. Even in situations where an accident exacerbated your pre-existing PTSD, you may be entitled to some compensation if you can prove your injuries. One of the issues that arise from a PTSD claim is the timing of the diagnosis. Many accident victims settle their cases fairly quickly. It is not unusual for a car accident claim to be settled within six months. It can take several months for PTSD to be diagnosed, especially if the victim does not realize that this may be what they are suffering from and, therefore, does not seek an immediate diagnosis. Once a victim settles their case, they cannot reopen it unless there are extraordinary circumstances. This means that if a case is settled prior to the diagnosis of PTSD, the victim may not be able to recover damages for the mental condition. This is why it is so important to seek medical care in an appropriate time frame. If you are experiencing symptoms of PTSD such as flashbacks, depression, persistent anxiety or changes in regular sleep patterns, seek the assistance of a qualified medical professional. If you settle your case before you seek a diagnosis for the emotional turmoil you are experiencing, you likely will not be able to seek compensation for your distress, even if you are diagnosed with PTSD. North Carolina car accident victims have rights. You have the right to file a personal injury lawsuit in order to seek recovery of monies paid out for medical bills, lost wages and more. Whether you are suffering with physical injuries, emotional injuries or both, we may be able to help you. Contact our team of accident attorneys to learn more about your legal rights. Call our office today to schedule your appointment for a free case evaluation.